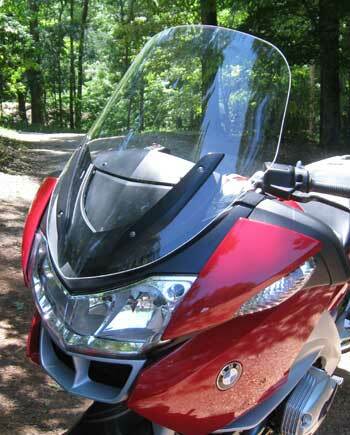 Road racing champion turned long distance traveler, Doug Teague assisted Parabellum with the design and testing of the Parabellum R1200RT windshield. Teague has more miles on a R1200RT than anyone we know and he has tried lots of R1200RT windshields and was just not happy with any of them for one reason or another. We tried different shapes, widths, heights until Doug was happy. WE GUARANTEE YOU WILL BE TOO. The Parabellum R1200RT is made from 3/16 inches thick (5mm) military aircraft type cast acrylic. The Parabellum windshield retains the stock adjustability and is 2 inches wider than the stock shield at the widest point. The Parabellum shield is offered in 2 heights and clear or tint. Our 24 inch shield is more upright so it is slightly taller than the stock BMW 24 inch shield because of the shape at the top of our shield. 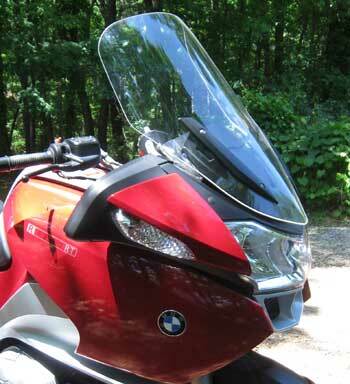 I just received and installed (10 minutes) your Parabellum Windshield for my BMW. I rode it to work today and I can already tell the difference over the OEM windshield. It's great! I just installed my Parabellum windshield that I ordered during the winter. WOW, what a difference. Quiet and definitely helps in 45 degree weather. Would recommend to anyone for short and long distance touring. BMWs are great machines but I don't know what they were thinking about when they designed the stock windshield. The Parabellum windshield is worth the money.